This article lists safety features and optimal stairway designs for older building occupants. These same specifications should assist anyone who has limited ability to climb stairs such as people suffering from arthritis. Page top photo: an older stair-user at Portofino near Genoa, Italy, facing a steep climb, angled stairs, and an open stair guard is nonetheless making use of a secure handrailing. This article discusses stair step designs for people who have trouble ascending or descending stairways. What about building long stair runs with steps each of which has a very low riser height? Here we discuss stair options for easy-climbing stairs and we point out where some low-riser step hazards may be lurking along the stairway. Stair falls are particularly dangerous for the elderly or for others with limited mobility. But does this mean that we should simply eliminate stairs, replacing them with ramps or stairway chair lifts? People who need or prefer those options should see RAMPS, ACCESS and also STAIRWAY CHAIR LIFTS. But there are also health benefits from using stairs, leading expert sources to avoid recommending simply stopping using stairways as we illustrate with the following excerpt from the Canadian Mortgage and Housing Corporation. Falls on stairs can be a major threat to health, independence and confidence. The physical consequences can be serious, including soft-tissue damage and broken bones — especially hips. There can be health benefits to using stairs. According to Health Canada’s Stairway to Health Program, activities like climbing stairs significantly contribute to the 30 minutes of physical activity we all need every day. 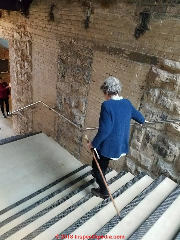 Stair climbing increases leg power and may be important in helping elderly people reduce the risk of injury from falls. What are the best dimensions for seniors with physical limitations i.e. Rheumatoid Arthritis? Excellent question, Cynthia. Experts suggest that for more physically limited people the best way avoid falls is to seek living accommodations on a single floor. Affi et als (2014 and earlier) have weighted the contributions of various stair features to the risk of a stair fall, considering for example, straight versus turned stairways, with or without landings, number of steps, handrail design, lighting specifications, and step design specifications (using a tread depth of 269mm and a riser height of 174mm with a 40 mm tread nosing in a case example to state various risk contributors. Afifi et als (2013 & 2014) specifically investigated staircase design for older adults. The authors examined riser heights between 152mm (5.98 in) and 190 mm (7.48 in). These riser heights or "step rise heights" appear to be the optimal range in riser height. The "going depth" or "tread depth" which I describe as distance from stair nose face to riser face was considered optimal at 280 mm to 330 mm. The authors cited < 280mm and > 330 mm as "worst-case" scenarios, but I suggest that for some situations such as exterior stairs where much long going depths are feasible those data might change. For an interior stairway, very long going depth dimensions are not practical because the total stair run becomes longer than will fit in most indoor spaces. 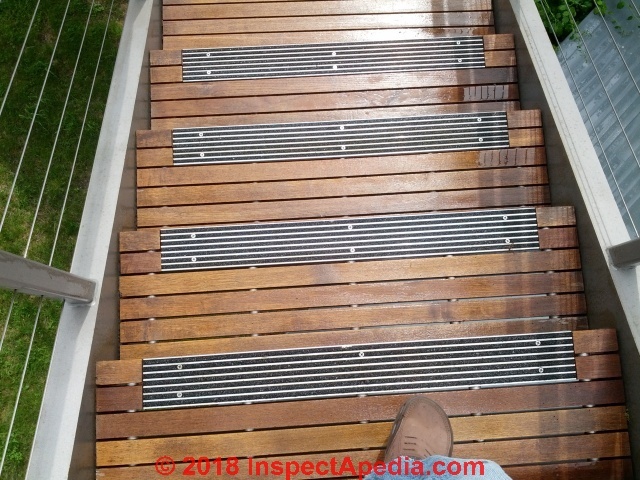 Furthermore the cost of converting an existing set of steps each having a 7-inch rise into a set of stair steps each with a 3.5" rise would not only double the run length of the stairway but it would be very costly. In some cases low-rise steps with intermediate landing platforms might fit into a building space but again, the cost of such a change is probably much greater than the addition of a stairway chair lift. Interestingly, recent research by Donath et als (2013) suggests that stair climbing can make an important contribution to the health, fitness, balance and heart condition of seniors. Beyond that I've seen with my own mom as well as in the literature, that the smallest irregularity in a walking surface, more than about 1/8", can form a trip and fall hazard. Indeed falls the major source of injuries in most countries (though traffic accidents claim more lives) and the major source of lost work time among the working population. Gunatilaka (2005) in recommending stair code improvements for Australia, focused on falls in the home and found falls causing 16% of all unintentional deaths (2002) and 23% of hospital admissions. Beginning at STAIR DIMENSIONS, WIDTH, HEIGHT we describe stair codes, construction, and design specifications. But Affi et als in a recent work (2014) cite an exhaustive if not exhausting list of stair features that are considered in assessing the safety of a stairway, from which we excerpt and adapt for cases where stairs are unavoidable and we are trying to both make stairs easy to climb and to minimize trip hazards we want first to pay attention to the following items. Geometric design of the stairway for seniors: stair shape (straight vs circular or composite, number of steps per flight). Stair cases may be straight, U-shaped, curved or spiral (in my opinion high risk because of irregular tread shape and reduced walking area as well as sometimes forcing a user to walk away from a handrail) or making a partial or complete turn; landings may be present or omitted. Number of steps in the stairway: both long stair flights (more than 12 steps) and short stair flights (less than 6 steps) increase the risk of falling. Optimal number of steps is 10-12 steps in the stair flight. Afifi (2014). Optimal tread depth: 280 mm (11 in) to 330 mm (13 in). The U.S. ADA excludes the stair nose in this dimension and measures tread depth from riser to riser. Use rounded stair nosing between 15mm and 25mm. Provide uniform tread dimensions in all respects: riser height, tread depth, levelness. See Jackson (1995). If you are building low-rise or short riser height steps to make steps easy to climb, be sure that the stair tread depth is sufficient to avoid awkward walking. Stairway lighting: proper lighting (for seniors and others) in the stairways is not only required in all model building codes, but is critical for elder-safety. Illumination of stairways used by older people should be at least 300-lux according to the Illuminating Engineering Society of North America (IESNA) and illumination must be consistent. The proper location of light switches is also very important. Handrailing & Grab-Rail design for seniors: secure, continuous, graspable handrailings, at the proper height. Figure 29 Grab Bars at Water Closets. A 36 inches (915 mm) minimum length grab bar, mounted 33-36 inches (840-915 mm) above the finish floor, is required behind the water closet. The grab bar must extend at least 12 inches (305 mm) from the centerline of the water closet toward the side wall and at least 24 inches (610 mm) from the centerline of the water closet toward the open side. A 42 inches (1065 mm) minimum length grab bar is required on the side wall, spaced a maximum of 12 inches (305 mm) from the back wall and extending a minimum of 54 inches (1370 mm) from the back wall at a height of 33-36 inches (840-915 mm). The toilet paper dispenser shall be mounted below the grab bar at a minimum height of 19 inches (485 mm). The height of the toilet seat shall be 17 to 19 inches (430 - 485 mm) above the finished floor. Clear visual cues of changes in walking surface help avoid trip hazards by making the presence of steps between rooms very apparent. Above: we added glow-in-the-dark non-slip stair tread tape placed along the front edge of these interior stairs made of brick. Particularly because the upper walking surface is identically-colored brick, at night in low light it is difficult to see the edge of the individual steps. Assure that walking surfaces are not slippery. With those basics in place, if people using a stair have trouble with tall treads we could, if space permits, use a shorter rise, even just 3-inches. BUT to do so every stair tread also has to be made longer (or "deeper" in the direction of travel). That is, we can't shorten the rise without making the tread depth greater as well. Otherwise the stairs are still a trip hazard. A lot of research has been done into optimal stair tread design. Interestingly the optimum stair design for ascending can be different from descending, so every stair design will have to compromise those theories. Photo: a sign points the way up steep, high-rise and uneven-rise but ancient pyramid steps at Atzompa in Oxaca, Mexico near the more popular Monte Alban. At ADA STAIR & RAIL SPECIFICATIONS [web article] we cite and discuss the U.S. ADA specifications for stairs and railings. There you will see that the ADA section 4.9 "Stairs" does not discuss short riser stair steps or "easily-climbable stairs".. The Department´s 2010 title III ADA regulation published September 15, 2010, should be used beginning March 15, 2011. ELDERLY & VETERANS HOME SAFETY - home safety & security checklist & home safety for older occupants. Home safety advice for the disabled and for veterans. Definition of Aging In Place systems and support for the elderly. Sources of home monitoring systems for the elderly. Sources of medication reminder and prescription refill services for the elderly. Sanford, J.A., Arch M, Megrew MB,"An evaluation of grab bars to meet the needs of elderly people", Assist Technol. 1995;7(1):36-47. This paper reports the findings of a study that evaluated the ability of 66 ambulatory and 50 nonambulatory older people to toilet independently and safely. A repeated measures research design included eight test trials in which participants got on and off a toilet using four different grab bar configurations each at two different toilet seat heights. Each trial was video-taped in order to determine patterns of grab bar use for each toilet height/grab bar configuration. In addition, pretrial and posttrial interviews were conducted to determine participant preferences and perceived safety. Results of this study indicate that some grab bar configurations that were not code-compliant were preferred and were used more often than configurations that were designed to meet Americans with Disabilities Act Accessibility Guidelines. These findings raise questions as to whether legally mandated grab bar requirements are appropriate for older individuals. SLIP TRIP & FALL HAZARD LIST, STAIRS - Photographs of all kinds of stair and step & walk defects illustrate a wide range of causes of falling down the stairs - stair trip and fall hazards and injury sources. Worn, Loose, Damaged Steps & Stair Fall Hazards. Narrow Tall Stair Steps, Slippery Stair Tread Surfaces. Curved, Angled, & Winder Stair Trip Hazards. Discontinuous, Awkward, Stairs & Steps. Curved, Tapered Steps & Stair Hazards. Lack of Visual clues to Indicate Presence of a Step or Stair. Is it a Step or a Passage? A rug at the top of the stairs is a fall hazard. SLIPS, TRIPS & FALLS, EXTERIOR STAIRS - Exterior Stair trip & fall hazard photographs & descriptions - a photo catalog of slip trip and fall hazards at outdoor steps and stairs. Dilapidated Stair Structures: rot, loose connections, pitched, wobbly, missing parts, collapse risk. Unsafe Landscape-tie or railroad tie step and walk tripping hazards. Archea, John C. "Environmental factors associated with stair accidents by the elderly." Clinics in Geriatric Medicine 1, no. 3 (1985): 555-569. 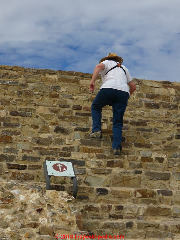 Stairs have been shown to be the most hazardous component of the everyday physical environment. The elderly have been identified as the segment of the population that is most vulnerable to accidents on stairs. Research reported herein attributes much of this heightened vulnerability to decrements in perceptual and motoric functioning associated with aging. Specific characteristics of stair design that have contributed to, or could minimize, this vulnerability are discussed. Afifi, Mona, Belinda Parke, and Mohamed Al-Hussein. "Integrated approach for older adult friendly home staircase architectural design." [PDF] Automation in Construction 39 (2014): 117-125. The older adult population requires special consideration in terms of interior architectural design. This paper presents a methodology which aims to investigate the risk of falling associated with the architectural design of staircase elements, in order to suggest best practices to create elderly-friendly design that enhances safety for older adults. The proposed methodology uses the concept of evidence-based assessment to evaluate staircase elements such as handrail and step design. This paper also presents a scenario-based rating system that assesses the degree of the risk of falling for different types of architectural staircase design. The proposed rating system was incorporated into a mathematical model and a Design Assessment Tree (DAT) that calculate the degree of risk associated with architectural staircase design to facilitate a building information modeling (BIM) approach. A hypothetical case study is presented to illustrate the effectiveness of the proposed methodology and highlights the essential features of the proposed model. Maintaining safety for older adults aged 65 years and older is a challenge that could be addressed by applying conscious design. Accordingly, the concept of creating a home environment which enhances safety for older adults becomes essential. 2) investigating the associated risk of falling for each geometrical staircase configuration through developing an evidence-based comparison for the proposed geometrical staircase configurations. The output of this paper is a hierarchical listing for geometrical staircase configurations which is arranged from lowest to highest reduction in risk of falling for older adults. Donath, L., O. Faude, R. Roth, and L. Zahner. "Effects of stair‐climbing on balance, gait, strength, resting heart rate, and submaximal endurance in healthy seniors." Scandinavian journal of medicine & science in sports 24, no. 2 (2014): e93-e101. With more pronounced effects in INT2, stair-climbing significantly improved resting and exercise heart rates, perceived exertion, and dynamic balance performance in healthy seniors and may contribute to better overall fitness, reduced fall risk, and less perceived strain during daily life activities. Gill, Thomas M., Christianna S. Williams, and Mary E. Tinetti. "Environmental hazards and the risk of nonsyncopal falls in the homes of community-living older persons." Medical care (2000): 1174-1183. No consistent association was found between the 13 trip or slip hazards and nonsyncopal falls, even after participants were categorized by impairments in vision, balance/gait, and cognition. Conclusions. Our findings do not support an association between environmental hazards and nonsyncopal falls. Gunatilaka, Ajith, Angela Clapperton, and Erin Cassell. "Preventing home fall injuries: structural and design issues and solutions." [PDF] Hazards 59 (2005): 1-17. Australia. Hindmarsh, Julia J., and E. Harvey Estes. "Falls in older persons: causes and interventions." Archives of Internal Medicine 149, no. 10 (1989): 2217-2222. Falls in older persons are an Important cause of injury, disability, and death. They are also Important as an indicator of decline in functional ability, requiring a careful assessment of contributing factors, in both the patient and the environment, with corrective intervention when possible. A fear of falls contributes to the problem by causing inactivity and deconditioning, further increasing the danger of falls. Identification of those at high risk and those who have begun to experience falls is important, followed by a systematic evaluation for underlying disease, medication effects, unsteady gait and balance, and environmental risk factors. Regular exercise and physical stress are also important in avoiding falls. Irvine, C. H., S. H. Snook, and J. H. Sparshatt. "Stairway risers and treads: acceptable and preferred dimensions." Applied Ergonomics 21, no. 3 (1990): 215-225. Stairway preference and acceptability were investigated with psychophysical techniques. A series of six experiments was conducted where subjects ascended and descended 19 sets of stairways with different riser and tread (run) dimensions. Subjects were instructed to identify stairways that they considered acceptable, and the one stairway they most preferred. The optimum riser was 7·2 in (183 mm), and the optimum tread (run) was 11 or 12 in (279 or 300 mm). These dimensions were acceptable to both males and females, young and old, and subjects of greater or lesser stature. Larger dimensions were not as acceptable to shorter subjects, and smaller dimensions were not as acceptable to taller subjects. The 4-in (102 mm) riser was almost totally unacceptable, and never preferred. The 5·14 and 9-in (131 and 229 mm) risers were acceptable to less than one-third of the subjects, and rarely or never preferred. These results are compared with existing practices and recommendations. Jackson, Patricia L., and H. Harvey Cohen. "An in-depth investigation of 40 stairway accidents and the stair safety literature." Journal of Safety Research 26, no. 3 (1995): 151-159. Each year thousands of people trip, stumble, and/or fall on stairs. This paper reviews prominent literature on stairway safety, and discusses findings from a preliminary survey of 40 in-depth stair accident cases. Variables reviewed and discussed include personal/demographic, external, and dimensional. From these findings and those of other researchers, it is hypothesized that the greatest problem with accident stairways is not individual (i.e., user) or external variables, but dimensional inconsistency inherent in some stairways. Areas for future research are also discussed. Kerr, Jacqueline, Jordan A. Carlson, James F. Sallis, Dori Rosenberg, Chikarlo R. Leak, Brian E. Saelens, James E. Chapman et al. "Assessing health-related resources in senior living residences." Journal of Aging Studies 25, no. 3 (2011): 206-214. Kim, B. J. "Prevention of falls during stairway descent in older adults." Applied ergonomics 40, no. 3 (2009): 348-352. 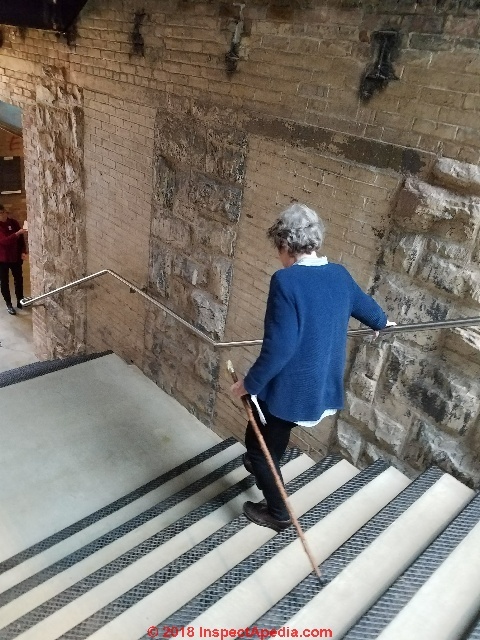 A prospective design was applied to examine how older adults would adapt stairway intervention stimuli to gait patterns during stairway descent to prevent falls. Ambient lighting and an auditory signal were used as stairway intervention stimuli. The gait pattern changes with and without stimuli were compared. No significant change of angular displacement was found between normal condition and intervention conditions under daylight and nightlight. The lighting intervention tended to increase the knee's angular velocity for both daylight and nightlight conditions, but not the ankle's angular velocity. However, adding the auditory signal to the lighting intervention under nightlight condition increased the ankle's angular velocity. Under the daylight condition, every intervention was significantly helpful to make people step on the floor more confidently compared to the condition without interventions. However, the intervention of lighting had an opposite effect on the confidence of stepping under the nightlight condition. The intervention of lighting may contribute to increase of confidence during stair descent while compromising the declined stride length in older adults and the potential “rush” factor for falls on stairs. Kose, Satoshi. "Housing for an Ageing Society: Adapting Housing Design toward Universality is the Minimum Requirement for Inclusion." In Aging, Disability and Independence: Selected Papers from the 4 th International Conference on Aging, Disability and Independence, pp. 19-39. 2008. Lin, Mau‐Roung, Steven L. Wolf, Hei‐Fen Hwang, Sheng‐You Gong, and Chih‐Yi Chen. "A randomized, controlled trial of fall prevention programs and quality of life in older fallers." Journal of the American Geriatrics Society 55, no. 4 (2007): 499-506. Livingston, Lori A., Joan M. Stevenson, and Sandra J. Olney. "Stairclimbing kinematics on stairs of differing dimensions." Arch Phys Med Rehabil 72, no. 6 (1991): 398-402. Lockwood, Ian M., and John P. Braaksma. "Foot accommodation on various stair tread sizes." Journal of Architectural and Planning Research (1990): 1-12. This study investigates the effects of changing the tread length of stairs with regards to several foot placement measurements. The experiment utilized a helical staircase to create tread lengths varying from 203.2 mm (8") to 279.4 mm (11") with a constant riser height of 177.8 mm (7"). Six test subjects descended each of the four different tread lengths at three different speeds and wearing various types of footwear. The results were obtained through analysis of data obtained by filming the experiment and using digitizing techniques. Marsh, Anthony P., W. Jack Rejeski, Wei Lang, Michael E. Miller, and Stephen P. Messier. "Baseline balance and functional decline in older adults with knee pain: the Observational Arthritis Study in Seniors." Journal of the American Geriatrics Society 51, no. 3 (2003): 331-339. Loose throw rugs and area carpets with curled edges or folds are among the extrinsic factors most frequently mentioned in the literature as unsafe and potentially increasing fall risk. Research has shown that hazardous rugs and carpets may be the most common environmental hazard in the homes of older adults,25 with one study finding loose throw rugs in nearly 78% of the homes,26 curled carpet edges in more than 35%,26 an average of more than 11 rugs without nonslip backing in each home. These hazards are even more common in homes of frail older adults with disabilities,27 who are at higher risk for falls. Evidence also exists that these flooring types may increase risk of serious fall-related injury. Simoneau, Guy G., Peter R. Cavanagh, Jan S. Ulbrecht, Herschel W. Leibowitz, and Richard A. Tyrrell. "The influence of visual factors on fall-related kinematic variables during stair descent by older women." Journal of gerontology 46, no. 6 (1991): M188-M195. Despite the documented health hazards associated with stair descent, the mechanisms of falling on stairs remain relatively unexamined. The objectives of this study were to define kinematic variables that could be used to describe foot-stair spatial relationships during the mid-stair phase of stair descent, and to investigate the effects of various visual and environmental conditions on those variables in a group of 36 healthy women between the ages of 55 and 70. Foot clearance and foot placement were measured through high-speed film analysis. Clearance between the foot and the stair during swing phase was small under all visual conditions. Degraded visual acuity had a significant effect on cadence, foot placement, and foot clearance, but visual surround conditions did not. The kinematic variables used in this experiment may be helpful in future studies to assess the results of interventions aimed at reducing the frequency of falls on stairs. Stevens, Margaret, C. D'Arcy J. Holman, Nicole Bennett, and Nick De Klerk. "Preventing falls in older people: outcome evaluation of a randomized controlled trial." Journal of the American Geriatrics Society 49, no. 11 (2001): 1448-1455. Templer, John, John Archea, and H. Harveoy Chen. "Study of factors associated with risk of work-related stairway falls." Journal of safety research 16, no. 4 (1986): 183-196. Warren, William H. "Perceiving affordances: Visual guidance of stair climbing." Journal of experimental psychology: Human perception and performance 10, no. 5 (1984): 683. Watzke, James R., and Bryan Kemp. "Safety for older adults: The role of technology and the home environment." Topics in Geriatric Rehabilitation 7, no. 4 (1992): 9-21. Wyatt, J. P., D. Beard, and A. Busuttil. "Fatal falls down stairs." Injury 30, no. 1 (1999): 31-34. This question appeared originally at STAIR RISE & RUN CALCULATIONS. I am ask to build steps for an older couple, one already has a hip replacement an the other getting one done, my steps hieght is three feet an the distence is five feet they need lower risers. Can someone tell what the dimensions would be? You can make short rise steps by making the stairway run longer. For example if you have a total rise of five feet and you want a 3-inch step rise you'd divide (5x12=60) 60 inches by 3 inches to get 20 steps that you'd need to build to climb up five feet. Of course you'll want to make the stair treads deeper front-to back to make such short rise steps safe and comfortable. And secure hand railings on both sides of the stairs will be important for folks for whom stairs are difficult. Watch out: when making stair treads "deeper" - that's increasing the distance from the stair tread nose to the stair riser - you need to avoid creating a halting-walk stairway trip and fall hazard. Simply making an 11-inch deep tread into an 18" deep tread in order to reduce the stair riser height can actually (in my OPINION) increase the risk of falling by making the foot placement difficult when descending the stairs. In that case the treads need to be deep enough to avoid a "halting walking step." See HALTING WALK STAIR DESIGNS for LOW SLOPES or SHORT STEP RISE for details. Continue reading at GRABRAIL GRAB BAR SPECIFICATIONS or select a topic from closely-related articles below, or see our complete INDEX to RELATED ARTICLES below. 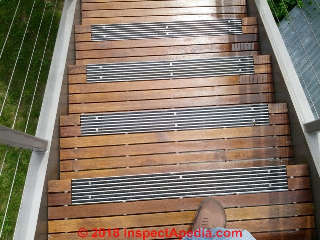 STAIR DESIGN for SENIORS at InspectApedia.com - online encyclopedia of building & environmental inspection, testing, diagnosis, repair, & problem prevention advice. The Home Reference Book, a reference & inspection report product for building owners & inspectors. The Home Reference eBook, an electronic version for PCs, the iPad, iPhone, & Android smart phones. The Horizon Software System manages business operations,scheduling, & inspection report writing using Carson Dunlop's knowledge base & color images. The Horizon system runs on always-available cloud-based software for office computers, laptops, tablets, iPad, Android, & other smartphones. ADA (Americans with Disabilities Act), Public Law 101-336. 7/26/90 is very often cited by other sources for good design of stairs and ramps etc. even where disabled individuals are not the design target. "Falls in the home and public places are the second leading cause of unintentional injury deaths in the United States, but are overlooked in most literature. This book is unique in that it is entirely devoted to falls. Of use to primary care physicians, nurses, insurance adjusters, architects, writers of building codes, attorneys, or anyone who cares for the elderly, this book will tell you how, why, and when people will likely fall, what most likely will be injured, and how such injuries come about. " Mold-Resistant Building Practices, advice from an expert on how to prevent mold after a building flood and how to prevent mold growth in buildings by selection of building materials and by anti-mold construction details. Steps and Stairways, Cleo Baldon & Ib Melchior, Rizzoli, 1989. "The Dimensions of Stairs", J. M. Fitch et al., Scientific American, October 1974. Abstract: Using a surface forces apparatus, we have investigated the adhesive and lubrication forces of mica surfaces separated by a molecularly thin, subnanometer film of a high-molecular-weight (2.3 MDa) anionic polysaccharide from the algae Porphyridium sp. adsorbed from aqueous solution. The adhesion and friction forces of the confined biopolymer were monitored as a function of time, shearing distance, and driving velocity under a large range of compressive loads (pressures). Although the thickness of the dilute polysaccharide was < 1 nm, the friction was low (coefficient of friction = 0.015), and no wear was ever observed even at a pressure of 110 atm over 3 decades of velocity, so long as the shearing distances were less than twice the contact diameter. Atomic force microscopy in solution shows that the biopolymer is able to adsorb to the mica surface but remains mobile and easily dragged upon shearing. The adhesion (adsorption) of this polysaccharide even to negatively charged surfaces, its stable low friction, its robustness (high-load carrying capacity and good wear protection), and the weak (logarithmic) dependence of the friction force on the sliding velocity make this class of polyelectrolytes excellent candidates for use in water-based lubricant fluids and as potential additives to synovial fluid in joints and other biolubricating fluids. The physical reasons for the remarkable tribological properties of the ultrathin polysaccharide monolayer are discussed and appear to be quite different from those of other polyelectrolytes and proteins that act as thick “polymer brush” layers. "Coefficients of Friction for Ice", The University of the State of New York Reference Tables for Physical Setting/Physics. New York: The State Education Department, 2002. Op. Cit. John E. Hunter, "Friction Values", The Source, Society of Accident Reconstructionists, Winter 1998. Study of frictional values of car tires involved in collisions on snow or ice covered roadways.